I recently created a Chemtrail page, where I will upload new videos of the chemtrails I photograph. This is an attack on planet earth, and all living inhabitants. How can these chemicals being released into the atmosphere, possibly not do any long-term harm to the soil, and all living life? One of my previous posts, has more information on geoengineering. Photographs are taken with an olympus 3 megapixel camera and taken in Niagara Falls, Ontario, Canada. Aluminum oxide and other oxides are being sprayed by these aircraft. Vitamin C, found naturally in fruits and vegetables is an anti-oxidant! Chemically, ascorbic acid (vitamin C) swaps electrons from the oxidant, turning something harmful into something harmless. You are what you eat. The food, chemicals, that go into your body, determine your state of health and well being. Why bother taking vitamin pills when you can get all your nutrients from real organic food? There are some organic companies that outright lie, research for yourself, or even better, grow your own organic food to ensure you and your families health and well being. My nutrients come from real food including hemp seeds, organic fruits and vegetables, organic fruit juices. I do not consume meat, fish, dairy, alcohol, or coffee. Your food intake is your choice. I really believed I needed meat to live for most of my life. I am living evidence that human beings do not need to eat meat, fish, or dairy to live a healthy life. You are free to eat what your heart desires! I work around toxic chemicals all the time at work, my diet is good for my life and may not be for everyone. I used to weigh 235lbs 2.5 years ago, today I am 140lbs. I lost all my weight from eating raw food. I only stopped eating meat, dairy, drinking alcohol and coffee 14 months ago. Smoking cannabis heals my damaged lungs, allowing me to take deep full breaths, where without cannabis I breathe more heavily and wheezing is aparent. I have zero cravings or need for cannabis. Why should I have to suffer, just to make someone that does not care about my health, happy that I am not on ‘drugs’? I only started smoking cannabis at the age of 17-18, when I tried it, I never started smoking often until I was 20 when it became crystal clear to me cannabis is the only medicine on this planet that actually heals my lungs. I hated marihuana most of my life, I lied to myself and others just to stay away from weed for most of my life. I do not use cannabis to escape from reality, why would I want to escape reality, I love life! I ceased using my inhaler 2 years ago. The last time I used an inhaler, was an expensive one and induced a bad ashma attack on me, which then I threw $200 in the trash. Cannabis has stopped 3 full blown ashma attacks I have had. Since I ceased using the inhalers I have had no ashma attacks, or loss of breathe. I work without smoking cannabis in an environment with toxic MDF dust, toxic paints (even the good filters are still only good to a certain point). I speak of my cannabis experiences because of all the misinformation and nonsense that is out there, group think is a dangerous thing. Industry is toxic and needs to change. There is no reason why paints, oils, fuels, fibre, plastics should be made from toxic petroleum. It is better late than never to start changing the way things are. Below is 1 propaganda website repeating constantly Aspartame is safe even though all the independent scientific investigations show the toxicity. 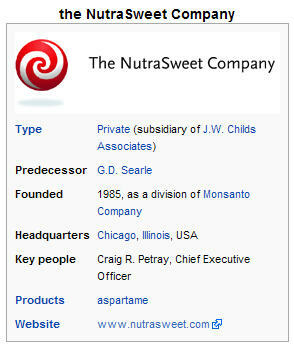 Aspartame Propaganda. * USDA Certified Organic food items. Neotame requires no labeling, this is reason enough to not eat any more certified organic food that is processed. The choices are limited, grow your own organic food, buy local organic food, or eat poison. Governments, and corporations will do anything, especially murder and poison the population for profit. Most food is pasteurized, sterilized, sucked of the real nutrients, then travels thousands of miles to the destination. Food should be grown locally by as many individuals and communities as possible, more individuals need to shop at local farmers markets, talk to the farmers, ask about what pesticides they use, and hopefully not use! Know where your food is coming from. Some great communities in america, and around the world, everyone grows their own organic food and share the harvest that is always too much. There are many fruits, vegetables, and herbs that can be grown easily, some with more effort. Strawberries are easy to grow in pots, in the ground or with hydroponics. Who does not love strawberries? I recommend surrounding your strawberries with a birds net to keep the squirrels out. In the summer I let the squirrels eat my strawberries, I even fed them peanuts and almonds. Rabbits love to tear apart gardens as well, I have heard of rabbits stealing the entire root from bean plants. These animals that do not eat meat, yet human beings eat them. I personally would not try and stop the animals from eating my harvest, I grow enough for myself and the animals. You should research what plants do best in your environment.The only solutions are to know the farmers you are locally buying from, or to grow your own organic food. I grew most of my vegetables and fruits in pots in the summer, I observed many gardens in hydro fields, on city property with their own compost, and all of them looked like good harvests, nobody destroyed them. Time to get creative. The last time I grew my own garden was 15 years ago, a few rows of tomatoes in the backyard. Practice makes perfect.